Back of mystery Hot Lotto ticket. A jury has found a former Iowa Lottery contractor guilty of two counts of fraud for allegedly manipulating the numbers so he could claim a multi-million dollar Hot Lotto prize. The prize was never paid out and 52-year-old Eddie Tipton was later arrested and charged with attempting to cash the ticket. 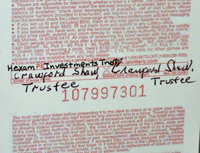 Tipton worked for the Multi-State Lottery Association and was prevented by law from buying Iowa Lottery tickets. The ticket for the 14 million dollar prize was turned just before it was set to expire on December 29, 2011. A New York attorney tried to claim the prize for a trust incorporated in Belize. Iowa Lottery officials refused to pay out the prize after people involved in the trust refused to reveal their identities. “There is no doubt this has been a fascinating case. We respect the court’s work and the jury’s verdict. The facts in this case have enabled us to further enhance our layers of security to protect the integrity of lottery games, and that ultimately has been a positive. This case is an important reminder that lotteries have to keep monitoring and making improvements to stay ahead of those who would try to beat the system. As a society, we may never be able to stop people from trying to commit crime, but we need to have strong procedures in place to catch and prevent them when they do.